Kids are go go go. Often there’s simply no time to stop for meals. Many children would much rather play outside or push their broccoli around the plate, rather than actually sit down and eat. If you happen to have an active energiser bunny or a fussy eater on your hands, then have we got an offer for you! 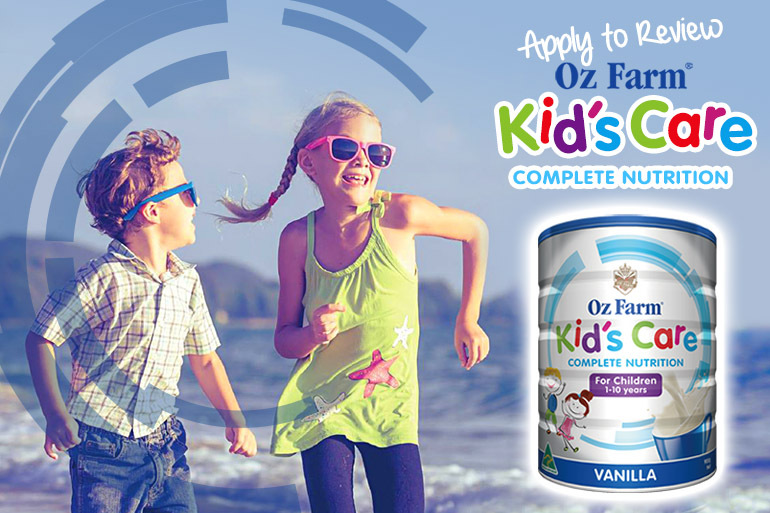 We are on the hunt for 15 families to give Oz Farm Kid’s Care Complete Nutrition a try. The Australian-made powdered milk is designed to help your child meet their daily nutritional needs, even if play sometimes gets in the way of meal time. Parents of fussy eaters, unite! While some kids will happily eat everything on their plate every mealtime, many won’t. My kids fall into the latter category. Often they will come home from school with almost full lunch boxes, saying they wanted to play at lunch rather than eat. And don’t get me started on the dinner battles! If it’s not cheesy or in chicken nugget form, then it’s pretty much the devil and my kids won’t have a bar of it. This is why we are so excited to trial this new product. And we would love other mums with fussy eaters/active tots to come on board too! Kid’s Care Complete Nutrition is suitable for children aged from one to 10. The energy-boosting super drink includes 25 vitamins and minerals to support growth and development. The easy-to-make vanilla flavoured milk gives kids the energy and nutrients they need to get through the day, even if they can’t get through a plate of veggies. OzFarm’s nutritional milk powders are Australian-made for optimal health, vitality and development. They are packed with heaps of energy-boosting nutrients including iron, phosphorous, selenium, calcium and zinc. It’s great for their brain, bones, teeth, vision, the nervous system and the immune system. Plus they contain sufficient kilojoules/calories for energy, essential fatty acids and adequate protein for cell maintenance. Plus a whole alphabet of vitamins! We’re talking Vitamin A, B1, B5, B6, B12, Vitamin C, Vitamin E and Vitamin K. I know – it’s a vitamin paradise! In powdered form. If you are a parent with an active adventurer or fussy eater aged 1 to 10, or are concerned about your little one’s diet and nutritional intake, then yes, please! Sound like your kiddo? Yep, mine too. 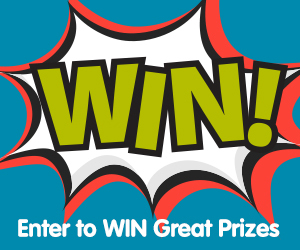 Join us as we trial Oz Farm’s Kid’s Care Complete Nutrition. Our mission is to help other parents make an informed decision on whether this product is right for their children. Help us do so by applying below, sampling the product and sharing your thoughts on Oz Farm’s Kid’s Care Complete Nutrition. I have 1 fussy 14 month old and 1 fussy 10 year old especially when it comes to their veggies. Because my son doesn’t eat enough to get enough nutrition. He’s a fussy eater. I have to give him multivitamins to help. I think this formula will help more. I would love to try this product! Although we give our children a well balanced diet, one child is struggling to put on weight so I’m always looking for something to add to his diet to hopefully see a weight gain. I have to fussy children Mr 5 and Miss 2 who would tell me what this product was like. They would also benefit from the extra multivitamins. This would also put my mind at ease and allow me to concentrate on a new born rather than food time battles. Nutritional meals are a prime aspect of a growing family however it is an ongoing challenge to somehow insert said meals into the mouths of babes – I feel Oz Farms Kids Care would be the Robin to my Batman… POW take that!! What a great way to ensure my daughter gets the nutrition she needs, in addition to her food intake. My 2 year old can be fussy and too busy to want to eat, it’s on those days I would feel less concerned if she had a replacement. Oz Farms Kids Care sounds perfect for those nutritional gaps in a child diet. My son is very active, eats fairly well most of the time, but always struggles to put weight on! My almost three year old is a fussy eater and very active. He often waits until bed time to tell us he’s still hungry as he’s too busy being active. This product would be great as he loves his dairy and vanilla is his favourite flavour. Have a 7 yo that won’t stick to a full healthy diet, this morning get help things along! As a mum of 4 very active children between 1 and 10 this would come in handy. My children can be fussy eaters. Being pregnant with baby no5 it would be beneficial not to worry about the nutrition. I have THREE fussy eaters aged 1 – 4 and any help I can get is A-OK with me! 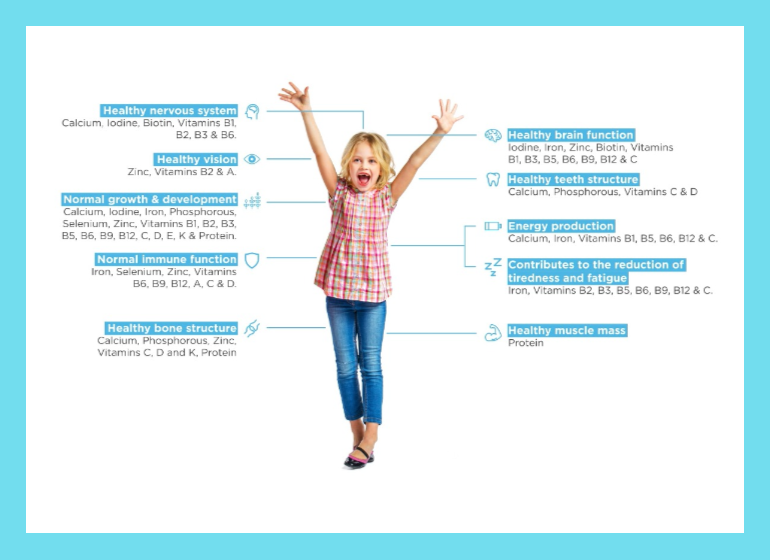 With an active and fussy daughter, we are often concerned if she is receiving the necessary intake of vitamins and minerals for optimum growth and nutrition. Being able to incorporate a healthy shake into her diet to ensure this would take away the worry. My daughter eats very little and extremely active we have tried everything to get her to eat enough to fuel her for all her activities. The dietician is unsure where to go next. My boy is a fussy eater and looks skinny and little. I need to get enough nutrition for him to grow up, not only for body but also for brain. My miss 3 has become quiet fussy with eating since she got the flu a few weeks back so would love to know she is getting all the nutrients she needs. I worry that my little ones are not getting the nutrition they need when they can be picky with what they eat. My 2 year old seems to prefer to live on pasta (or biscuits and chocolate!). He doesnt eat vegies and very little meat. Even sneaking the food into other foods and he still manages to find them!Its frustrating and worrying! My 9 year old is incredibly scrawny, he is hyperactive and has trouble sitting still long enough to eat a full meal. I would love to try Oz Farm on my guy. We have gone down the supplimetal drink path a few times now and mr fussy hasnt been a fan. Hopefully i can finally find a drink that can be a daily suppliment to his fast paced life. With three under the age of 8, sometimes it’s difficult to make sure that their always eating the most nutritious meals and sometimes just getting them to eat is a challenge. I work long hours and sonny best to cater to my kids fussy eating habits, just so I can get them to finish what’s on their plates. One won’t eat anything green, one is a pain to get to eat any sort of protein and the other is always so active that he won’t sit still long enough to consume a proper meal. I would love my kids to try OzFarm’s product to hopefully see an improvement in my children’s nutrition and so I can stop stressing so much about making sure they eat. Because applying a healthy lifestyles contributes to my child’s sense of wellbeing and builds his confidence in himself. Perfect for my fussy eaters, it sounds amazing and what a nice feeling to know they are getting more nutrition into them than they do now. Hiding veggies and fruit muffins are the only way my children get nutrition. I’m exhausted by the fight, and would embrace a drink with nutrition, because they would reach for it, and I’d get a break from worrying about their health. I’ve no idea how they keep so active! Oscar is fussy and doesn’t eat everything so this will give him the nutrients required. Master 6 is Very fussy eater. He hardly has any fruit and veggies in his diet. He currently loves having his milk before bedtime. This would be fabulous to try out to give him the extra nutrients and vitamins that he needs. I have 3 children, 2 are a bit fussy but my 5 year old will not eat anything unless its crappy foods ( we dont buy it or have it in the house) but she will scream for it, and will scream and yell ( we have had neighbours coming over and checking on her to make sure she is ok!! and not being hurt) ( we have good neighbours) if we make her eat dinner, breakky she is good and lunch/ snacks) she is good with but just dinner she will not eat, and will scream for hours! My 14 month old has just been diagnosed as iron deficient which is having all sorts of negative effects on his health and general well being. Being able to offer him something like this that will help boost him back up would be wonderful. With two super crazy active little orcs in the home, who will eat a healthy big meal one day and then refuse to eat the same thing, or very little of anything on other days, it is hard to maintain a continued healthy diet to keep their ever learning minds powering along. My 3 year old takes fussy eating to a whole new level. He won’t even eat pancakes! The end result is a lot of sickness, geographic tongue, poor sleep, crankiness!!! I would love to try anything that will boost his vitamin intake!! My granddaughter is a fussy eater and having something extra for her to drink will benefit her. Having to take iron supplement is really hard, as some days she refuses to take it with her juice. 9 year old only eats 3 vegetables…tin corn, potato and cucumber. No amount of coercing will influence her to try any other veges. I do worry about her nutritional intake. She also has a new orthodontic plate which is limiting what she eats, too. Kid’s Care Complete Nutrition would be the ultimate solution to filling in the gap. Its even harder to get him to eat. I have a very fussy 3year eater. Its so frustrating at meal times. Cant get him to eat anything healthy! I have a 5 year old girl whos very fussy and i have to cook everything separately. She cant put any weight on and when shes sick loses up to 2 kg. Ive tried everything to make meal time more fun and interesting but no result! I have an extremely fussy 9 year old that will not eat meat, fruit or vegetables and as she won’t eat these foods she always gets sick. She does not get enough vitamins and minerals for her body this drink formula would be awesome for her. Oy! Mr 3.5 has gone from a decent eater to a kid who would live on Yoghurt, cheese, banana, peanut butter and milk since Mr 6 months was born. We are so worried about his nutrition. Would love to supplement him with something like this while we get him back on track. My 6 year old is such a fussy eater she’ll just refuse to even try new foods so I would love something that’ll give her all the nutrients she needs without having to bribe her. My 3year old is very fussy and as a result he’s underweight. He loves his milk and that keeps him going. Add the mix to the diet and he’ll be stronger and healthier getting the nutrition he needs. My daughter has been a fussy eater her whole life and she’s currently in hospital so this would be a life saver because i would know she’s getting everything she needs in a yummy shake. I have an extremely fussy three year old who will only eat sausages and cocktail Frankfurt’s. He was born quite ill and has struggled to maintain a healthy weight throughout all his weight check ins. To top it off he is the most energetic three year old you will ever meet who is always on the go either playing inside or outside. I have attempted to try vitamins and alternate drinks to no avail. This would be the perfect product to try for my baby! I have tried many different protein powders and nutritional supplements for my daughter. Not only is she an extremely fussy eater, she is vegetarian and quite small for her age. I would love to try this to see if it make a difference for her. My son has autism & along with that he has issues with eating. He is small for his age due mostly to his food issues. He would choose to not eat instead of eating which is hard for him. However he LOVES milk & milkshakes!! This product would really help us to get the nutrients he needs whilst allowing him to gain them whilst drinking milk!! Thanks. I like a lot of mums, have a very fussy eater. My almost 2 year old little man, generally eats fairly healthy, he loves his fruits, yoghurts, cheeses and milks, but hates eating dinner meals except pasta. I worry that he is not getting enough variety of nutrients and would love to give this a try please. I have a very active 4 yo boy, but like a lot of kids his age he’s really hard to get to eat. I’m sure he’s not getting what he needs nutritionally. I’d love to try this to help him get more of what he needs! My 4yr old son is THE fussiest eater I have ever come across. He literally won’t eat any vegetables or meat, except chicken nuggets. He won’t even try chicken schnitzel, even though we have told him its the same thing time and time again. He will sit at the dinner table FOREVER and even dry reach/try to spew when any food that he doesn’t like or want touches his mouth. His name is Cruz, but we’ve nicknamed him Cruzkit because all he wants for dinner is vegemite Cruskits & grapes. I have tried everything I can think of to get him to try more nutritional foods, a reward system- new toy each week, nope. A chocolate or lolly treat after dinner, even after one bite, nope. When dinnertime rolls around, I’ve literally had enough before I’ve even started. Please HELP me! 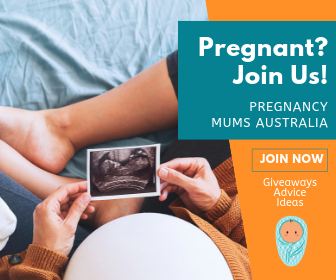 I would love to be given this opportunity to give this a go for my son. He is looking anaemic, as he is not getting any nutrition at all. I’m at my wits end as what to do next. I have a 6 yr old fussy eater who has never eaten any vegetables since he was 2 . I have to give him multivitamins all the time . Hoping kids care will give him enough nutrients . I have two very fussy eaters. Aged 5 and 2. I worry about them both. The 5 year old will eat some fruit but no veggies or meat (except frankfurters or polony). The two year old will not eat meat, veg or fruit. It’s a constant battle and nothing I try seems to work. Getting picked for the trial would be a god-sent. At least I would know they were getting everything they need to be healthy. I would like to try this for my 2yo Jack. He refuses dinner most nights even if it’s familiar food he loves and slowly heading backwards on the growth charts at 6% weight for age his my tiny little man. My 2 1/2 year old boy thinks everything is ‘disgusting ‘. Grrr. He can’t live on strawberries for the rest of his life! I want to give him the best start in life, but, short of administering drip feeding, I think this will be a much less invasive alternative! I need Help im at my wits end. I HAVE a 4 nearly 5 year old that is very picky and has sensory issues. I have a 4y.o. who is petite for her age, but very able and super active, unfortunately, due to our financial situation i am ashamed that she doesn’t get all the nourishment she needs and deserves, though i try. This powdered milk may help get the balance closer to level so she can continue to flourish. I have an almost 5 year old who struggles to put on weight, has quite a few food aversions & is extremely active. I also have an almost 3 year old who refuses most food & would live off milk if she could, this would be a godsend! I have a 9yo that doesn’t eat. He doesn’t eat fruit, veggies, pasta, rice, meat, eggs, chicken, fish, 99% of dairy. I can’t find any nutritional drinks that he likes the taste off. Hopefully this will be a winner. I have a 4 year old and an almost 2 year old and most days it is so darn hard to get them to sit down and actually eat food! they are always too busy playing or annoying one another haha! To try this and it work for my kids would be amazing. Not only do I have an active kid but I have a fussy one too. Feeding has been a challenge since birth. Breastfeeding was never easy (latching problems, tongue tie, mastitis with abscess) and he self-weaned at 7 months. Then eating was going great guns until he got gastro and regressed massively with food. Will not touch fruit and very fussy with vegetables. Nutrition is a constant issue which we are trying our very hardest to work through. He’s now just broken his collarbone so it’s even more of an issue now – so that his little body has the nutrients necessary to repair and heal as quickly as possible. I’d love to trial this as he does love vanilla shakes/drinks and the Ozfarm Kids Care Complete Nutrition could be just the ticket to supply him with all the goodness our busy fussy boy needs. Getting my 5 year old to eat is virtually impossible, unless it’s chocolate, chips, or lollies! No one believes me when I say ‘Isla just isn’t into food’ but it’s so true. Sure, we go through phases where it’s “ham sandwich mummy, no crusts, flat please with butter” or “boiled eggs mummy with no yellow bits” but just on a day to day basis her eating is terrible. Initially I wasn’t too concerned because she’s not underweight, or hungry but lately I get concerned about her concentration, her energy and her colouring. She’s quite pale. Milk, she loves milk. She’d drink milk all day everyday. I want to try this product with the hope that it will give her tga extra boost, that it’ll provide her with some extra nutrition and will be something that I can incorporate into her daily meal times to ensure she’s getting the things she needs. My daughter is a fussy eater and I know milk is not giving her all the extra nutrients she needs. As a busy 3 year old she needs the extra boost and I need the peace of mind! I have three extremely active boys aged 3,6. And 10 all are fussy eaters.. Anything is worth a try right? Our 5 year old son is always on the go and we struggle to sit him down long enough to enjoy a nutritious snack. We even battle at mealtimes to get him to try or eat a balanced diet. I worry that he’s not getting the vitamins and minerals he needs to be an active , healthy kindergartener. Would love to try this product having 4 kids aged between 1 and 11, we are always looking for help with their nutrition. 2 very fussy eaters would benift from something like this! Would love this for my very fussy 8 year old son!! I worry he isnt getting what he needs! I have an underweight 20 month old and a fussy 5 year old. I have tried everything to try and get nutrition into them. I have a skinny 4yo, she’s been flagged by the school nurse as underweight (she eats well, genetics plays a part). We are using sustagen at the moment but would love to try something else! I have an underweight, extremely active (adhd) 7 year old with sensory issues, and an extremely limited diet. I would love the opportunity for my child to try this product. I have 6 children, 4 of which are aged between 1 and 10. My 9 year old is extremely fussy when it comes to vegetables and meals. If she were allowed to eat nothing but cereal and sandwiches she would do it in a heartbeat! She is also very active and enjoys multiple dance classes, netball and basketball. My 7 year old was a premature baby, is very petite and needs additional nutrition. My 5 year old is a very adventurous boy and flat out refuses to eat dinner and much like his sister, really only likes to eat cereal and sandwiches. And then my 2 year old isn’t fussy as such but eats very little. We also live in an area with a lead smelter and so children’s nutrition is a big focus point. I am always on the look out for anything to boost their intake. With 2 kids under 7 with ASD & sensory processing disorder, eating is always a challenge. Both kids have oral aversions so I’m always on the lookout for something that will boost their daily needs intake & build their immune systems and help them grow healthy & strong. I’m very keen to give this a go & see if they enjoy it! I’m tired of preparing healthy meals. He’s 10 years old, very active . He likes only fried crispy foods. He never tried eating veggies. It’s easy to feed him while he was 2-4 years old. It affects his performance at school. His pedia did everything , but I’m so tired. I have a very, very active 5 year old and a 17 month old that is not far behind her. My 5 year will not eat a single veggie put in front of her, and I’m running out of meal ideas that hide them. She needs the extra engery to keep her going as school and activities run her down. I have a very very active 5 year old who is just on 15kg. He doesn’t eat at school and just eats small amounts of food at home, he doesn’t like chicken or meats and I’m always supplementing with vitamins & probiotics to ensure he is getting enough vitamins and nutrients. He always has a glass of milk for breakfast & I would love to trial this for him. I have an extremely fussy 3 year old who has issues eating solid foods. He doesn’t like them so this would be an awesome product for us to trial. I would love to try this. I have two children a 3 year old who is super fussy and doesn’t eat veg/fruit no matter how hard we try. And a almost 2 year old who is driving us crazy. My 6 almost 7 year old is very fussy. He has sensory issues especially around food and has about 10 things he will eat mostly dairy (thankfully he grew out of his lactose intolerance). We are lucky that he is in the healthy range for both height and weight but to be honest 8 don’t know how considering what he will eat. Even vitamin tablets are hit or miss depending on the look/flavour or his current mood. Anything that helps would be appreciated. I have 2 boys (1&4) who both don’t eat enough of everything and it would be great to have this for extra nutrients they need to grow and be healthy! I would love to try this with my 2.5 yr old. He had serious throat surgery at the beginning of the year and had to have a liquid diet for some time and now refuses to eat most solid foods. I spend so much time worrying that he’s not getting the right nutrients for a very active 2.5 yr old boy so using this would be one less then to worry about. Would love to try this for my son! All i can get in him is chicken nuggets, chips, sausages and jam sandwiches! It drives me crazy and I worry about his nutrition! Next step is seeing a specialist..
We would be very happy to try any new product on the market. My son is 8 years old and has autism and adhd. He’s sadly diagnosed as having failure to thrive and now he’s heading down eating disorder category as he’s off the lowest percentile for his age and height. Having a son that cannot gain weight no matter what you try is so upsetting, I’ve lied awake crying many a night. We’ve tried every supplement on the market including prescription ones. Sadly the taste of all of these products is the reason he won’t drink it, even blended in smoothies he can detect it. I’m hoping for a miracle, maybe this could be the one he likes and finally I’ll see some weight on my precious boy. With 2 girls aged 7 and 5 that lead very very active lives (school, netball, gymnastics and swimming) I would love to see if this would make a difference to them at the end of the week when they do get a bit tired! My 5 & 1/2 yr old has always struggled with dinner time, we recently found out that he has low muscle tone, hypermobility and connective tissue laxity which all combine and make him too tired to be able to do things like chew his meat of a night time so this would be a great option for him of a night time. My daughter is 6 and survives on hot chips, chicken nuggets, sausage sandwiches and only my spaghetti bol. She is very active but we have no idea how she gets all her energy. She will go days without food if she isn’t able to eat her “normal food” she gags on anything that isn’t “junk food”. She frustrates her father and I. We have no idea where her fussiness comes from as our eldest daughter eats everything you put in front of her. I have a fussy 3.5 year old. She struggles to put on weight and would be excited to try this product! In our household of 6 kids/ step kids, it’s not practical to be watching everyone to make sure they’ve eaten their veggies or even to know if their school lunches and snacks are ending up in the bin. I strongly believe that everyone’s behaviour is linked to their nutrition…. a few days of junk or lapsed nutrition and our household turns into an abundance of negativity and stomping of feet. It’s hard to trust that vitamin tablets are actually beneficial, and there’s not a chance we can add super green powders to everyone’s diet, so I’d love to trial this. A milk with brekkie will fit right into our routines. I would love to try this product as I have a fussy 2 yr old and 5 yr old, who don’t eat anywhere near enough veges and meats, so need the extra added vitamin and mineral boost. I would love to trial this product for my fussy 3 year old that doesnt like veggies or meat. Having another younger child with many intolerances as well as a fussy eater, it would make life alot easier knowing shes getting the nutrients she needs without the headache of trying to get her to eat. I have a very active and fussy kids – 5 yo boy and 8 yo girl. They are are both very low weight for their age and I would be interested to test out whether this would increase their body mass. My 3 year old is very fussy and has recently very reluctantly ceased breast feeding. He gets very tired and I he’s only a little guy. I worry he’s not getting all he needs. I have 4yo twins who are very fussy and if one says no, the other copies in a heartbeat. I really need and want to get some decent nutrition into them but up until now, not sure how!! This product sounds exactly what my 2 year old Lachie needs! For Lachies first year he had a very boring diet due to a rare food allergy, lots of purée and introducing one new food a week. Due to a simple diet he has not been fond of many foods, he seems to gravitate towards breads and crackers. Whilst I offer and hope he tries and successfully likes new foods, I would love to use a product like this one, that way I know he is getting lots of vitamins and nutrients. Woohoo, a milk drink that is actually good for them! My son is a super fussy eater, and I worry constantly about his diet. He hates fruits and vegetables, no matter how I disguise or dress them up. This drink sounds a perfect way for him to get some essential vitamins and minerals into his diet (without him knowing). Thank you for producing something like this, has there is a lot of demand for it. I would love to try this product because my fussy child refuses to eat most of his meals but he loves milk so this would be a great alternative to meals. Mia (1.5 )and Trent( 4 )are very small and really do struggle to gain any weight. Mia isn’t a fussy eater yet does not absorb the goodness from food and Trent is a very fussy eater due to Autism and food textures so I would love to try them both on this to help them out. My 4 year old son has had chronic tonsillitis for the past 3 years and has never eaten real food, he lives off weetbix and toast. He will not eat anything else. We had his tonsils removed in Jan and would love to get his eating back on track. For a complete nutrition hit!